This biggest quest of the summer starts now. Which is… to find a good peach. Just ONE good peach. I’m lucky to get one or two good peaches every summer, which probably means I should move somewhere that has better peaches. And I tell you the same thing every year. Or I can just cover them in a little sugar and butter and caramelize the heck out of them. I vote that option. It’s caprese season, meaning that I can survive on tomatoes and mozzarella as long as I have a heavy handed dose of balsamic glaze or vinegar. And I know that last Monday I talked about making my favoritest summer salad ever but now it’s a new Monday and this is another favorite salad and they happen to be totally different so that’s allowed. Jess law. I’m completely DYING over this. I thought about keeping the tomatoes in but they aren’t super perfect here yet and I didn’t feel like buying a few orange rocks from the grocery store. So glad. With the peaches and cheese and basil and vinegar and… and… and… UGH. So simple but so good. Kind of ridiculous to tell you about this again, but I know you like some simple dinners too. This is something I can fully get behind as only dinner. Maybe with a little grilled bread. Sold. Heat a skillet over medium heat. Sprinkle the peaches with the brown sugar, then add the butter to the skillet. Once melted and sizzling, add the peaches and cook until golden and caramelized, about 3 minutes per side. To assemble the salad, alternate a peach slice with a slice of fresh mozzarella and a few basil leaves, making a low row or a circle. Sprinkle the salad with the smoked sea salt then drizzle generously with the olive oil and balsamic. Devour. Holy MOLY! I cannot wait until Napa’s farmers’ market on Saturday to nab some peaches and try this! sooooo this was the lunch special at my office today. coincidence, or do you have a very big fan at an insurance company in boston? This salad looks amazing. We have great peaches in North Carolina, but I still want to caramelize one just for this salad! I’ve never been a huge fan of caprese, until now, thanks for the peach option! Peaches are my soul mate. I eat at least one a day in summer. Surprisingly Costco tends to have AMAZINGLY peaches. But if you really want the quintessential peach experience, in August or September order some from Gold Bud farms. You won’t regret it. What a beautiful take on a classic salad recipe. This is a gorgeous take on caprese, what a great dish! Love this. I’m going to do this for July 4th and I’m going to grill the peaches first. ANother way I love peaches is WITH tomatoes. Great salad. Pinning this. It’s so wonderful looking. Made this for guests tonight. It was Killer!!! Love your blog, and thanks so much for this awesome recipe. Holy cow, this looks AMAZING!! We are still trying to decide on a grill, but as soon as we do I am definitely making this! I needed this yesterday. oh my salad. yum, yum! My boyfriend loved this so much that he licked the plate! He’s asked for it practically every nite since then and I’m happy to make it because it’s easy, fresh, and freaking delicious. You are a fruit recipe genius! What a delicious idea! Totally on board with you – loving this salad! Great presentation too. First time on your blog and getting hooked on it! Wow you’re a genius for making a peach caprese instead of traditional tomatoes! Now I want to run to the nearest fruit stand and buy a big basket of peaches. Never tried eaches with cheese before, thanks for the recipe. Pingback: 5 Aromatic Dishes to Try for Your Dinner Party ║ Recipes You'll Want to Share - What the Doost!? Just made this. You’ve got to be kidding…. No words here either. Mmm this sounds and looks delicious! Can’t wait to try this. Trust me! 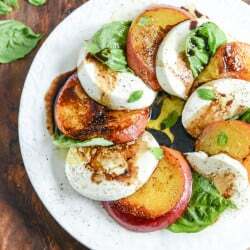 I have never tried caprese and your peach caprese pics and recipe is so inviting. Going to try it soon. Thanks for sharing your recipe. You **need** to move somewhere where they have fresh peaches all year-round and stop making lame excuses for why your peaches are so caramelized. You need to do it right away!! Every year you say the same thing about peaches and it is starting to get old so time for a major change baby! Fresh succulent peaches year-round just do the research and moooove!